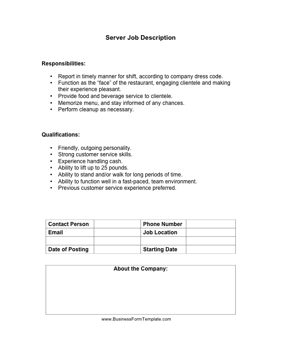 If you need a new waiter for your restaurant, bar or pub, use this server job description for advertisement and new employee training purposes. Report in timely manner for shift, according to company dress code. Function as the "face" of the restaurant, engaging clientele and making their experience pleasant. Provide food and beverage service to clientele. Memorize menu, and stay informed of any chances.